The Venus Entry Probe (VEP) TRS examined various options for in-situ exploration of the atmosphere of Venus by means of a balloon. Venus has been targeted because it is the closest object for such a technologically challenging in situ atmospheric investigation. 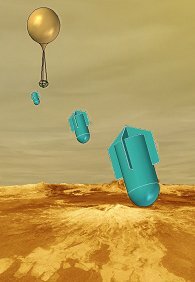 Though the focus of the study is on Venus, many of the technologies required to enable a European ballooning mission to Venus are also applicable to other planetary bodies with a significant atmosphere (for example, Titan). Venus resembles the Earth in many ways, yet the most basic questions about the evolution of the planet and its atmosphere are still a mystery. 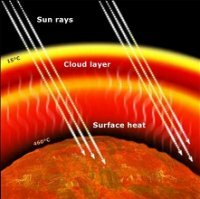 A more accurate knowledge of the complex Venusian atmosphere is not only of interest for planetary science, but also for understanding the greenhouse effect and for validating atmospheric chemistry and circulation models of Earth's atmosphere. The VEP mission concept consists of an aerobot, which will analyze the Venusian middle cloud layer together with a remote sensing satellite. During flight, the balloon will deploy active ballast probes, which will measure basic physical properties of the lower atmosphere during their descent. A long duration aerobot flight is desirable in order to provide a global coverage for the descent probes as well as for determining spatial variations of minor atmospheric constituents. In order to provide regional and global context of the in-situ measurements, it is necessary for the remote sensing atmospheric investigations to commence prior to the aerobot deployment. 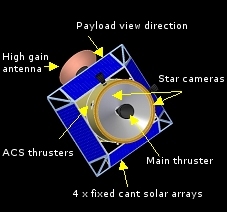 This is accomplished with a two-satellite configuration; the Venus Polar Orbiter (VPO), which contains a remote sensing payload suite for atmospheric investigations and the Venus Elliptical Orbiter (VEO), which deploys the entry probe from a highly elliptical orbit. 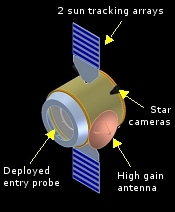 The VEO subsequently acts as a data relay satellite, thus allowing the VPO to practically continuously monitor the Venus atmosphere. 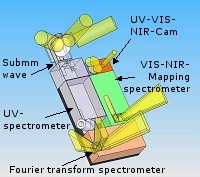 The Venus Polar Orbiter focuses on studying the dynamics of the Venusian atmosphere. In order to investigate the dynamics of the polar vortices, the spacecraft should be in a polar orbit with a relatively short period (< 5 hr). A launch with a Soyuz-Fregat 2-1b from Kourou has been selected as the baseline for the Venus Entry Probe study because it is a cost-efficient and highly reliable launch vehicle with sufficient mass capability. The transfer phase typically takes between 120 and 160 days. A conservative reference launch date, November 2013 has been selected, which implies that the mission concept could be launched at least every 2.5 years. The launch vehicle capability for direct escape to Venus is 1509 kg (assuming a 20 day launch window around 2 November 2013). 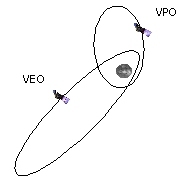 The entry probe will be released from the VEO spacecraft, while it is in a highly elliptical orbit around Venus. As the probe enters the dense Venusian atmosphere, it will decelerate due to the aerodynamic drag. Before the probe reaches subsonic velocities, a parachute is deployed to provide stability during the transonic phase. The front heat shield is released shortly after deployment of the parachute. To prevent heating from the rear aeroshell, the back cover is separated from the probe by a tether. The parachute release and aerobot deployment starts at an altitude of ~55 km. After inflation of the balloon, the gas storage tank is released and the aerobot will gradually rise to cruise altitude. 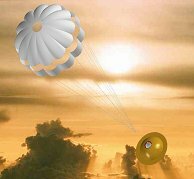 The light gas balloon will stabilize at an altitude of 55 km, where the environment is relatively benign (temperature 30 °C and pressure 0.5 bars), while still in the scientifically interesting Venusian middle cloud layer. The goal for the mission duration is to travel at least twice around Venus, which translates into approximately 14 Earth days. This will be accomplished by dropping ballast probes and strictly controlling the gas volume in the balloon. The latter will be achieved by the implementation of a gas replenishment system and a gas release valve. During the day, the aerobot will be powered by amorphous silicon solar cells, which are mounted on the gondola surfaces. For the night, primary batteries are baselined. The average power consumption during the night is ~5 W, compared to ~10 W during the day. The maximum power demand is 40 and 60 W for night and day, respectively. During flight, the balloon will drop fifteen small ballast probes (~100 g each). These ballast probes contain a small payload that will determine vertical profiles of physical properties of the lower atmosphere (temperature, pressure, light levels). The horizontal wind velocity will be deduced from the microprobe trajectory. In order to investigate both the local weather patterns as well as the global atmospheric dynamics, the microprobes will be dropped in 5 separate drop campaigns, spaced equally over the mission lifetime. From a technological point of view, the atmospheric entry is one of the most challenging parts of the system. One of the key aspects is the testing and qualification of heat shield materials, such as, for example, Carbon-Phenolic, that allow a steep entry into the dense Venus atmosphere. The mission operational lifetime is driven by the availability of a balloon with a low gas leakage rate. A balloon envelope suitable for the harsh Venusian environment needs to be developed. Additionally, the balloon manufacturing process should ensure low leakage seams. 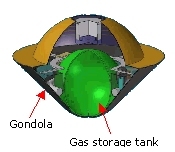 Gas storage is a mass and volume driver. Though a pressurized gas tank has been selected as a feasible baseline, new technologies such as cold gas generators (currently under development with ESA funding), show promise for significant mass and volume reductions. Highly efficient and stable triple junction amorphous silicon solar cells are an enabling technology for the Venus aerobot. Improvements in primary or secondary batteries or new lightweight advanced power generation technologies that can be used to power the aerobot during the night would greatly reduce the gondola mass. Alternatively, low-power instruments and subsystems, as well as efficient power management methods should be explored. 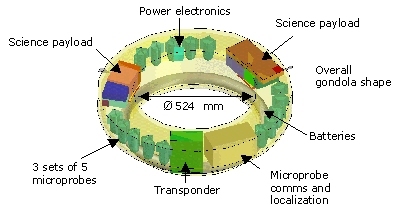 A miniaturized deep space ranging transponder will be required as well. 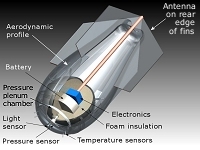 The critical enabling technologies associated with the microprobes are the localization and communication subsystem (currently under development by QinetiQ), as well as the aerothermodynamic design. 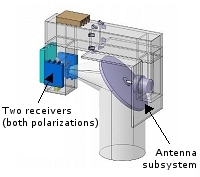 The integration of all subsystems into a functional atmospheric microprobe will also be a challenging activity. This study was completed in 2005. It was carried out by SRE-PAP with the assistance of Surrey Satellite Technology Limited (spacecraft and aerobot gondola design), Vorticity Ltd (entry system analysis and aerobot design), Cosine Research B.V. (strawman payload design), and QinetiQ Ltd (microprobe design).